Giclee is a word used to mean a fine-art printing process that uses digital images and high-end printers, inks, paper and canvas material. The word literally means “to spray” and is a reference to the way the printer sprays the ink onto the canvas. Giclee is a relatively new process that has been increasing in popularity among artists and photographers over the last ten years. 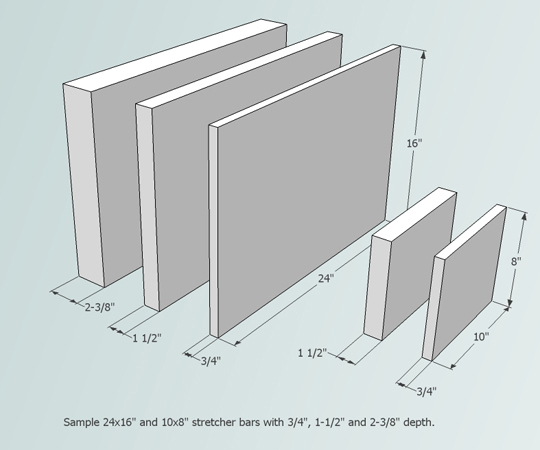 The Giclee process starts with a digital image file. Most of the time we print from files taken from a digital camera. We can also print from scans, or digital art created on the computer or though a combination of scanning, photography, and digital imaging programs. The image is prepared for printing. It is sent to the printer, and the image is sprayed on a “substrate” (paper or other material) using pigment-based inks. The word “Giclee” is also used more specifically to refer to printing on canvas using the Giclee process. Since Giclee printers can print on a wide variety of materials, it is popularly used to reproduce fine art, or make photographs into canvas pieces. 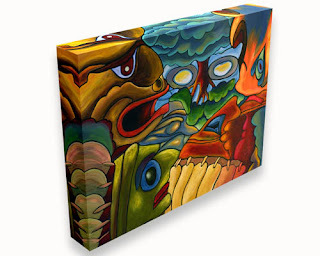 The image is sprayed onto canvas, and the canvas is stretched on a wooden frame. 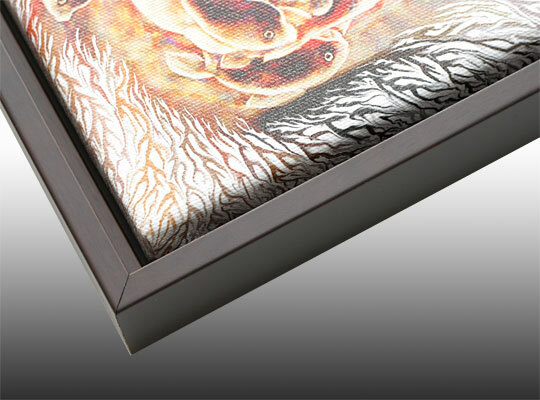 In order to create Giclees on canvas, the canvas print is taken by a framer and “gallery wrapped” to create the traditional look of an artist's canvas. 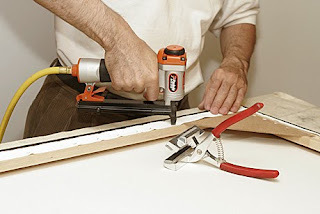 (gallery wrapping refers to a canvas being wrapped or stretched around a wooden frame. This is the method that artists have been using for centuries to prepare their canvases for painting and hanging. Many paintings in museums are mounted using this same process) the canvas can then be framed using almost any type of frame, or left unframed for a more modern look. There are other ways to produce printed artwork. Previous to the development of Giclee, artists used four-colour offset lithography to produce copies of their work. This process is still used, and is more economical for large print runs, but due to the difficult and time-consuming setup involved, offset printers often require print runs of 1000 or more. For individuals or artists running on-demand businesses, Gilcee are much more economical. 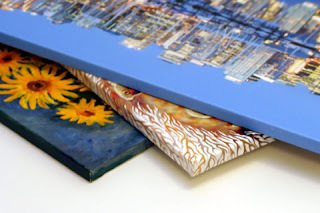 Artwork can also be transferred to canvas using a chemical canvas-transfer process. This works quite well, but it requires a printed original that can be sacrificed, since the process strips the inks out of the print and transfers it to the canvas. This is a physical rather than a digital process, it can only be done once, and the image can not be re-sized for the size of the original. It is quite effective for mounting posters that deserve a more elegant display, but it is not recommended for irreplaceable originals, and it is not actually a reproduction method, since you start with one print and end with one canvas. The major advantag e to the Giclee process is its accessibility and quality. With this process, it is possible for anyone to make almost any image into a fine art print or canvas. Professional artists can use it to reproduce work and sell to more customers, photographers can use it to create beautiful displays of their shots, and others can use it to make art out of family photos, great vacation photos, or any image they just happen to like. Because the setup for Giclee is digital, it is no problem to do single prints. There is no time-consuming chemical process or expensive setup, but the high quality of the pigment-based inks, the precision of the printer, the fine texture of the material and the high quality available from digital files insures that the print rivals other processes in colour, detail, and texture. If you are starting with a physical image, whether an old photograph, a poster or a painting, the image can be scanned to create a digital copy, and then printed using the Giclee process. The quality of the final product will depend on the quality of the scan. The improvement in digital scanners means that paintings, photos, negatives, and slide can yield very excellent results. A major benefit of digital reproduction is that it you can increase and decrease e the size easily, making both posters and art cards, large canvases and small, from the same image. Canvas giclees are one of the paints that looks more natural due to more production. Eventure is a Professional Website Design Company and Internet Marketing Agency specialising in Ecommerce, Organic Web SEO and Elearning. Based in Nottingham our team supplies design, development, search engine optimisation and marketing services to business throughout the UK, Europe and the United States."